Photo by Greg Schechter from San Francisco, USA. This file is licensed under the Creative Commons Attribution 2.0 Generic license. The Atlantic humpback dolphin is a toothed cetacean native to, of course, waters of the Atlantic Ocean but whose populations are at least 2,000 kilometers apart from each other. This species is a close relative of the Chinese white dolphin (Sousa chinensis). Sousa Teuszii is a robust dolphin, with a narrow and mid-sized snout and rounded head because of his big melon. It has a very pronounced hump on which it raises a broad and rounded dorsal fin. It has a wide caudal fin with a notch in the center. Males of the Atlantic Humpback Dolphin are larger than females, and the length of an adult is 1.8-2.6 meters. The weight is around 100-139 kilograms. The back and sides of the animal have a slate gray color while the belly is light gray. 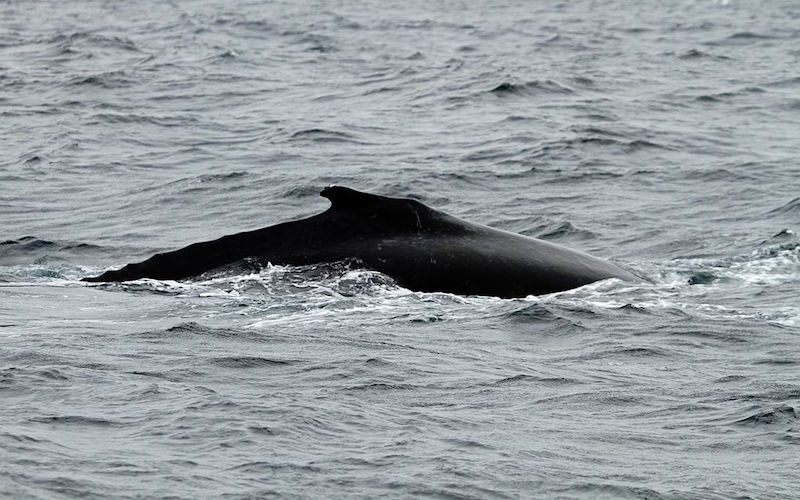 Undoubtedly, its most striking feature is the hump on the back on which the dorsal fin is. The Atlantic hunchback dolphin inhabits warm, tropical waters of the eastern part of this ocean, in the west coast of the African continent from Morocco to Angola. It dwells in coastal and shallow waters about 2 kilometers from the coast, in bays, deltas, estuaries with mangroves, canals, and rivers within its range of distribution although it does not go upriver far from the ocean. It is not a river dolphin. Despite its preference for shallow waters, it is possible that this dolphin stays around reefs to take shelter from predators and to swim along the seabed. This cetacean feed on fish, crustaceans, and cephalopods. Among their favorite prey are mullets, breams, herrings, sardines and squids. Their feeding habits vary according to their habitat but usually coordinate with a pod to capture their prey. In Mauritania, it associates with local fishers to catch mullets, in Senegal it enters the brackish water channels when the tide rises and returns to the ocean when the tide get low. In any case, its echolocation plays a crucial role in the detection of their food. HOW DO THEY BEHAVE? BEHAVIOR. The behavior of this dolphin does not seem to have much in common with that of other curious and energetic dolphins. On the contrary, it is a slow-moving species that swim at about 5 miles per hour. During the day, it swims alone or in groups of 5 to 7 individuals, but the maximum number of members in a pod is around 25. It is quite shy and does not intend to establish contact with humans, and it even avoids boats. It reaches the surface to breathe every minute but can be under the water for up to 3 consecutive minutes. It can perform acrobatic jumps, but it is not very common to see it doing it. It communicates by whistles and a kind of squealing. The Atlantic humpback dolphin is a polygamous animal that mates with multiple partners throughout its life. Most of the information on the reproductive habits of this dolphin are hypotheses created from their closest relatives, the other members of the genus Sousa. It is unknown at what age they reach sexual maturity, but many individuals begin to reproduce between four and eight years of age. A specific mating season is unknown, although, due to the number of births between March and April and an apparent gestation period of 12 months, males and females breed during the summer months, as the Chinese white dolphin (Sousa Chinensis chinensis). A female usually has one offspring which at birth, it has a length of approximately 1 meter and weighs between 9 and 11 kilograms. 24 to 48 months later the mother weans her calf, but they can stay together for more time. After 4 or 5 years, the calf separates from its mother and joins another pod of dolphins. The Atlantic humpback dolphin has a conservation status of “Vulnerable” in the Red List of the International Union for the Conservation of Nature (IUCN) as its coastal habitat, very close to human populations, makes this species prone to be affected by the Anthropogenic activities. In some parts of West Africa, native communities catch this dolphin for human consumption. In the coastal waters of Senegal, Gambia and other African countries, populations of this species are already scarce, because for many years the entanglement in fishing nets has caused bycatch which still happens today. Overfishing affects the availability and abundance of their usual prey, which can fragment the food chain. – Destruction and degradation of their habitat. The destruction of mangroves and the contamination of coastal waters directly affect the survival of this dolphin. As they dwell close to the coast and the marine traffic in their distribution range is high, they are continuously hit by boats and propellers causing life-threatening injuries. CITES (Convention on International Trade in Endangered Species of Wild Fauna and Flora) included the Atlantic humpback dolphin in Appendix I of the most endangered species, and therefore the organization prohibits commercial hunting of this dolphin.